Poděbrady is a Czech spa town situated in the Central Bohemian Region of the Czech Republic. It’s around 50 kilometres east of Prague and the journey takes about an hour on the train. It’s a very clean town and the surrounding countryside is fantastic. Poděbrady is also remarkably free from foreign tourists. So if you want to live like a local in the Czech Republic, it’s a very good place to go. 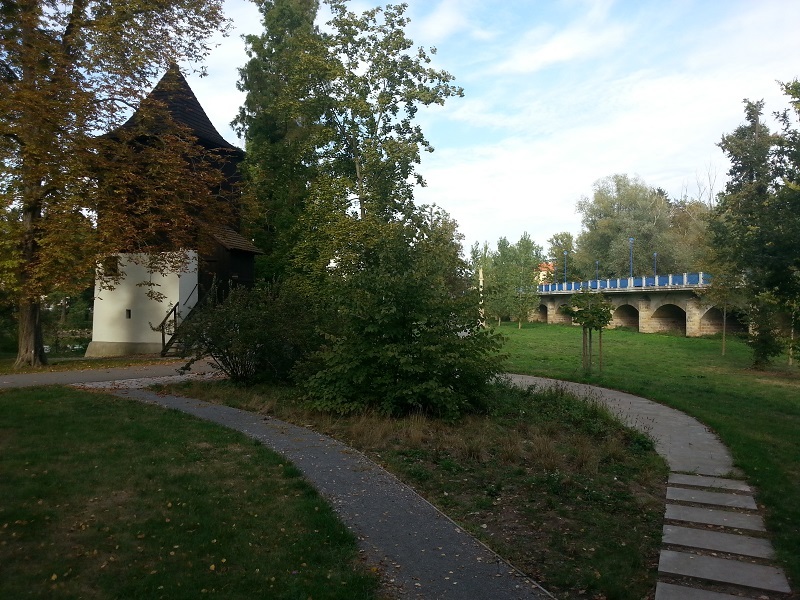 The town of Poděbrady is famed for the healing properties associated its natural spring water, which is believed to be very good for the heart. It’s one of the most respected Czech Spa Towns and Many ailing individuals flock to the town each year to receive treatments in the wellness centres that are located in the hotels in and around the Spa Resort Park. 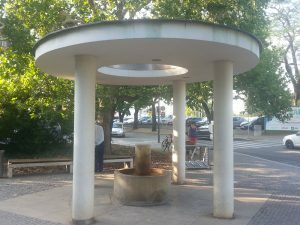 However, anyone can take advantage of the healing powers of the spring water without paying to do so because there are mineral springs located all over the town. Most of them have several taps and it’s not uncommon to see small groups forming around the springs as people wait their turn to fill their bottles or take a drink from one of the taps. There’s a lot more to Poděbrady than just the spring water though. There are plenty of other interesting things to see in and around this beautiful Czech Spa town. George’s square is the oldest part of the town. It’s home to several restaurants and ice cream parlours and is somewhat dominated by the statue in its centre. 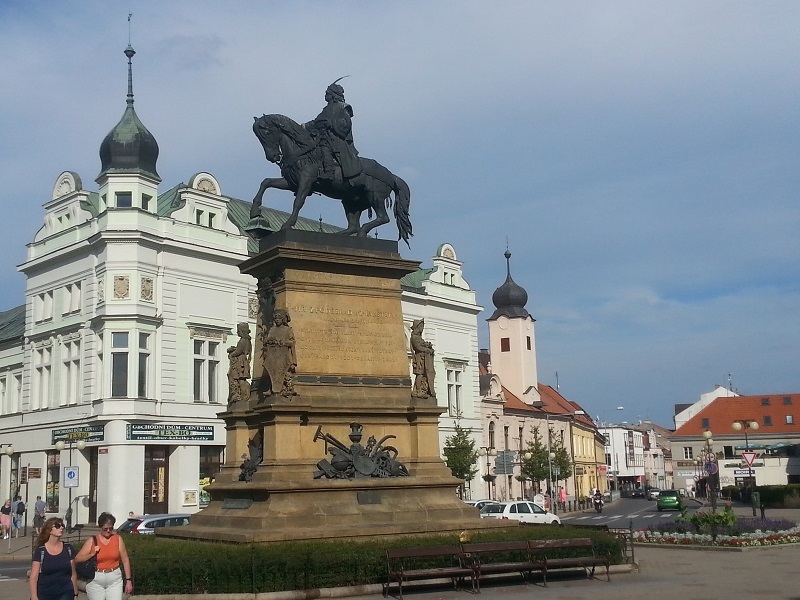 The statue depicts King George of Poděbrady riding a horse and it’s considered to be one of the greatest works of 19th Century Czech monumental sculpture. The Equestrian Statue of King George is made from hammered copper plates that are affixed to a steel frame within, though you’d be unlikely to guess its secret while standing and admiring it from the street. The unique sculpture has been standing in the Centre of Poděbrady since 1896. The Chateau is also sometimes referred to as Poděbrady Castle. Even the information pamphlet provided by the town’s tourist office uses both terms. The text refers to it as the Chateau and it’s shown on the map as the Castle. Poděbrady Chateau can be accessed from George’s Square. The entrance is only a few meters from the Equestrian Statue of King George. The Chateau is the most important landmark in the town. It’s a large and impressive building that’s home to the Institute for Language and Preparatory Studies of Charles University. That and many other parts of the Chateau are not accessible to the public, but it’s still possible to visit the former chapel, which contains a memorial to King George. It’s also possible to visit the part of the Chateau that’s alleged to be the king’s birthplace. This 14th-century church is located on the other side of the river from the town square and the walk from the square to the church should not take more than 10-20 minutes, depending on your level of mobility and fitness. The Provost’s Church of the Elevation of the Holy Cross is in incredibly good condition, but that’s not surprising because it’s been reconstructed a number of times. If you visit the Church, it’s worth taking the time to inspect the stonework above the door. The quality of the carving is first-rate and the stone used to construct the walls is amazingly clean and new-looking. The Miner’s Church is only a few meters away from Provost’s Church of the Elevation of the Holy Cross. It stands near the river and although it’s much smaller than its neighbour and is not nearly as impressive to look at, the story behind its construction gives it additional interest. Constructed in the neogothic style, the Miner’s Church in Poděbrady stands on the spot where 10 rebellious miners were executed in 1946. The present church is a reconstruction. The first church constructed to commemorate the tragic event was made from wood. It was built in 1516. The Miners Church people who visit Poděbrady can see today is made from stone and it’s been standing there since 1896. Poděbrady Spa Resort Park (Lázeňský park) is designed in the style of an open English park. 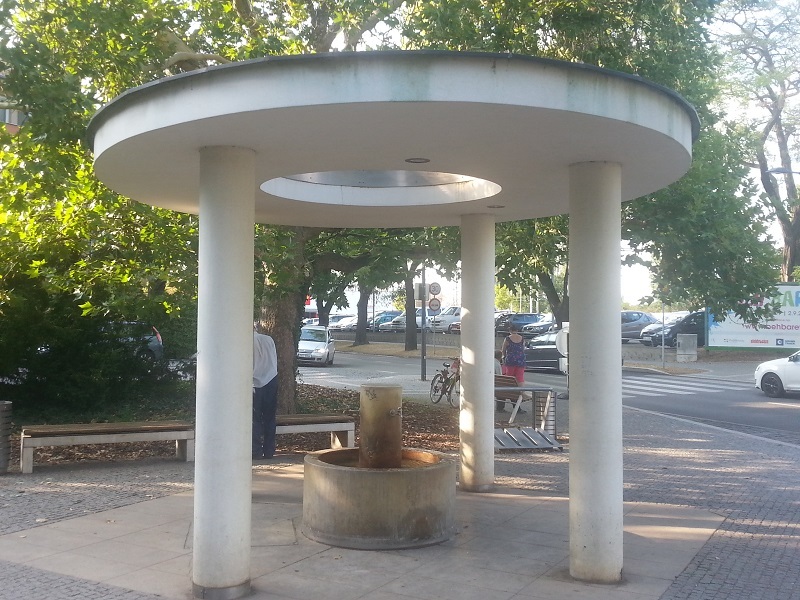 Among other things, the Spa Resort Park contains several water fountain displays and the Professor Libenský Colonnade. The path that leads from George’s Square to Poděbrady train station runs along the side of the park and is lined on one side by many restaurants. During the warmer months of the year, there is always plenty of people strolling up and down the path and this area is a very popular zone for social gatherings. The Spa Resort Park is also the venue for a number of important events, staged throughout the year, including the Soundtrack Festival. Poděbrady is a beautiful town. I lived there for a month, spent a lot of time walking, and loved to go jogging along the riverside. I’ve been jogging in a number of countries, but the route I took in Poděbrady is the most memorable. The scenery is fantastic. While I was running I encountered many other joggers, numerous people cycling, and a lot of rollerblade enthusiasts. 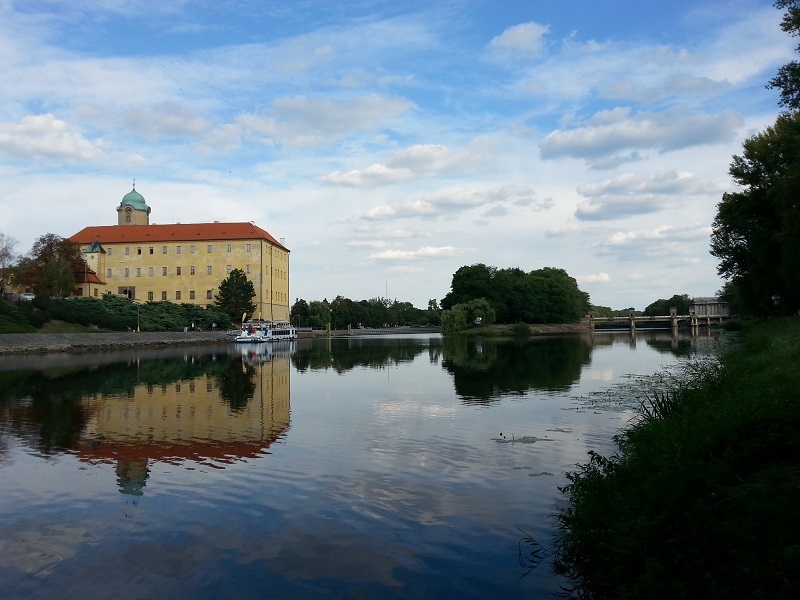 If you want to keep fit in beautiful surroundings, Poděbrady is a good town to visit. I also have fond memories of the Spa Resort Park. I sometimes used to go and sit outside some of the bars along the edge of the park and have an afternoon beer. 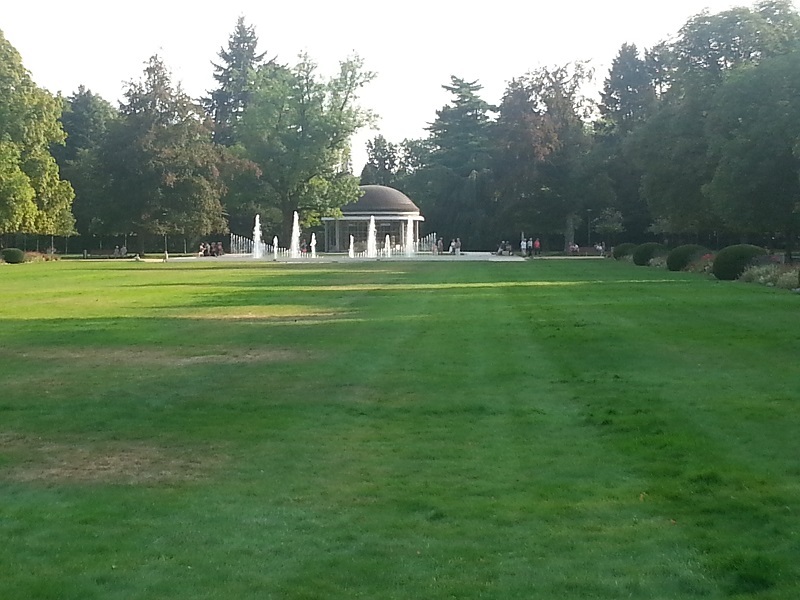 I enjoyed looking at the water fountain display and watching all the people strolling along the path. Although Poděbrady is only a relatively small town, it has several nightclubs. In my opinion, the Charles Bar is the best one by far and it’s easy to find because it’s situated in the lower part of the Chateau. I liked to go there on Saturday nights. The beer is cheap, the music is good and, apart from two dance floors and three bars, the Charles Club in Poděbrady also has a terraced area where you can drink outside and look down on the river. 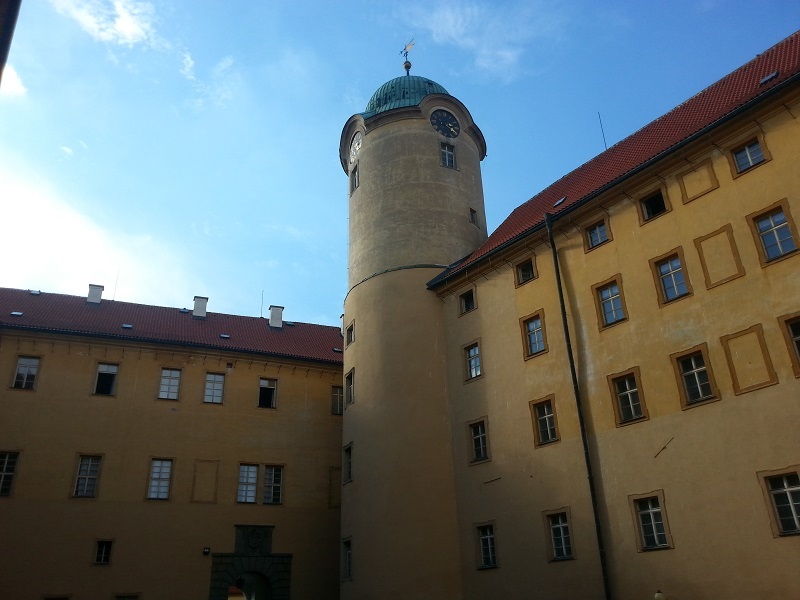 When I first decided to go to the Czech Republic, I tried to arrange accommodation in Prague, but it turned out to be easier to rent a room in Poděbrady and I am so glad that I did. I generally prefer to live in big cities, but the Czech spa town is such a lovely place to be I am glad I chose to get a room there instead of Prague. The choice also made it easier for me to experience the Czech way of life. I rarely encountered anyone who was not from the Czech Republic. I love Prague, but it’s a capital city and capital cities are always filled with tourists. One of the things I miss most about Poděbrady is the natural spring water. The first time I tried it I found the taste very strange. I later grew to love it and every time I went jogging I ended my run by drinking from one of the mineral water fountains. One of the interesting things about the mineral spring water in Poděbrady is, due to the fact it’s so high in iron, if you leave it in a bottle for a day or two the clear look of the water becomes more cloudy and the bottle begins to adopt a rusty look. However, the thing I remember most about the water is the way it made my mouth tingle. Especially when I drank directly from the fountains. It’s slightly gaseous and, if you store some in a bottle, when you open it there is a slight fizzing sound similar to what you hear when opening a fizzy drink. In the future, it’s highly likely that I will return to Poděbrady because I found so many things that I like. If you are planning on visiting the Czech Republic and want an interesting alternative to Prague, you may find you like this easy-to-overlook Czech Spa Town as well.